If you’re a big Bruce Campbell fan like me, you’ll probably be tempted to watch Man with the Screaming Brain (2005). Written and directed by and starring Campbell, it sounds like a safe bet. I mean, Bubba Ho Tep was funny, right? Let me gently remind you that nobody can be funny ALL of the time. And for the first thirty minutes of this movie, you will find yourself thinking this very same thought several hundred times. Campbell plays William Cole, a shady corporate industrialist traveling in Bulgaria to set up a tax scam. He’s traveling with his wife Jackie Cole, played stiltingly by Antoinette Byron, who might be wearing that hideous blond wig in the hopes that nobody will recognize her in this stinker. Bruce Campbell is trying too hard to play the obnoxious American, and the result is boring and unfunny at the start. The banter between Campbell, Byron, and Russian cab driver Yegor (played by Vladimir Kolev) is forced and hokey. The relief comes when a mysterious Gypsy woman murders the three of them, but it takes much too long to get to this major plot point. Good news for the Coles and Yegor: there’s a mad scientist in the neighborhood looking for hapless victims to conduct experiments on. Said scientist transplants Yegor’s brain in to William Cole’s body, presumably with the expectation that hilarity will ensue. We are treated to ten minutes of Cole and Yegor battling for control of Cole’s body, until they realize they were both murdered by the same woman, and decide to work together to hunt her down. In the meantime, Jackie Cole’s brain is transplanted in to a robot. I wish I could tell you I was making this sucky plot up, but sadly, this is really what the movie is about. My heart breaks for all of the Campbell fans out there who will try to stab out their own eyeballs with knitting needles in an effort to stop watching this crapfest. The highlight of this movie is Ted Raimi, who plays the mad scientist’s assistant, Pavel. It’ll warm your heart to see that he’s still finding work, and that he isn’t the worst thing about this movie (that honor goes to the Jackie robot, which malfunctions much easier than any terminator I’ve ever seen in the movies, and at the worst possible times). Raimi is—dare I say it?—actually kind of entertaining in this role, and helps make the film almost bearable. Almost. Overall, this movie reminded me of a hilarious comedy with Lily Tomlin and Steve Martin battling for control of a body that I saw once. Only All of Me (1984) was funny. 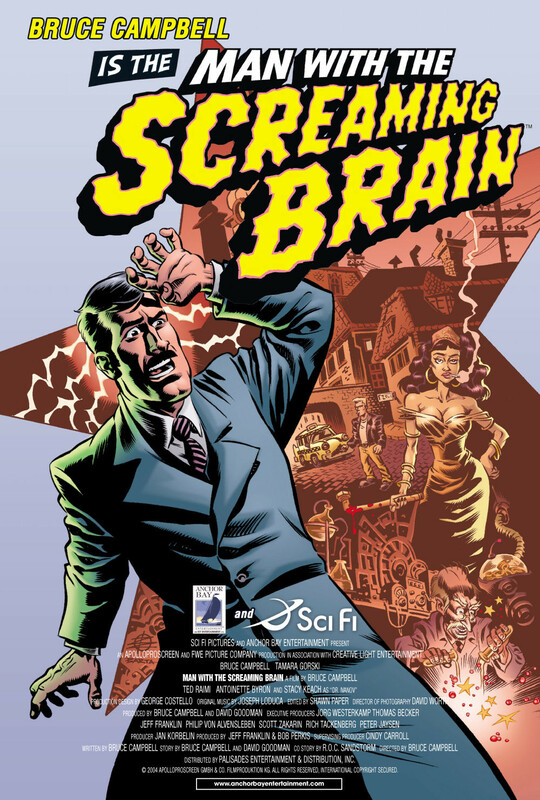 Man with the Screaming Brain, with the standout exception of Ted Raimi, is not.